This week: University of Cincinnati student Max Schneider. Max has been on four mission trips, including two trips to El Salvador to volunteer with The Fuller Center. 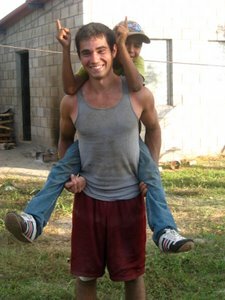 He led the University of Cincinnati Holiday Build to El Salvador in December 2008, and is scheduled to return in 2010 to lead students on a spring break build trip. Max: There are a few basic necessities of life, and shelter is one. El Salvador is different from the United States in that there are virtually no government sponsored social programs for the poor. By providing them with shelter, [partner families] have a place to tuck their children in at night and can focus on moving their family forward. No other place I have been has meant as much. I have formed relationships with the kids, masons and others in the country that have had a great impact on me. My phone rings at least twice a month with calls from El Salvador. There is something special about that project – the people, the country, the worksite – that continually draws me back. Everyone there is unbelievably friendly and … the country is gorgeous, with many beautiful sites to visit. The Fuller Center staff is constantly helpful both before and during the trip. It all comes together there, and this combination has given El Salvador a place in my heart. I have realized I live in the upper percentile of the world and what I see day to day is not the reality of many people on this earth. The experiences of the mission trips have taught me a different way to view life, allowing me to see it through others’ eyes. [By going on the mission trips], I’ve realized that views are shaped by upbringing, and with countless cultures and ways of life on our planet, each person has their own perspective. Traveling and finding myself face to face with extreme poverty, I’ve realized that while I may not agree with certain attitudes or philosophies, who am I to judge? 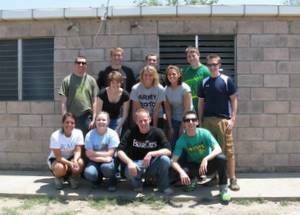 Join us for a wonderful opportunity to build homes in El Salvador! To join an exciting build trip to El Salvador, or to request more information, contact globalbuilders@fullercenter.org. To register for an international Global Builders trips, Click Here.